Halloween is just around the corner and some spooky decor is in order. This year, add a touch of rustic appeal to your Halloween decor by using Wrought iron in your Halloween theme. You can easily buy wrought iron Halloween decor elements like garden stakes and hanging silhouettes. These can be used year after year and make Halloween preparations a lot easier and more organized for you. Every year on October 31st, Halloween is celebrated. Children and adults alike dress up as their favorite characters from all the scary movies imaginable, you find draculas, vampires, werewolves, zombies, fairies and witches all out to have some fun. Kids go for trick-or-treating, and people host Halloween parties for friends and family members. Decoration and costumes are a major part of this event and a lot of thought and effort is put into Halloween decor every year. We have come up with a spooky Halloween line complete with a rusted look to create the perfect effect. 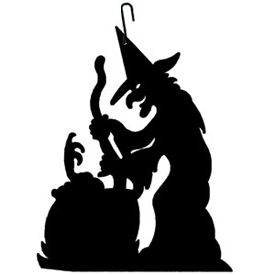 Try a wrought iron Halloween garden stake this year, complemented by hanging silhouettes of witches with brooms, and pumpkins with evil looking grins. These props will work well with the usual carved pumpkins that are commonly used for Halloween décor. If you are hosting a Halloween party, or are simply doing up your front yard for Halloween night, wrought iron is a great option that looks unique and yet in line with the overall scary and magical themes. You can easily play up the decor by adding lights, cobwebs and other details. For a more dramatic effect, you could opt for audio effects as well. 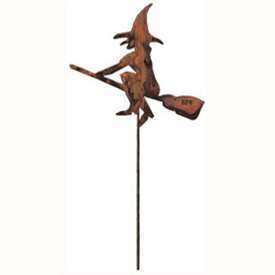 Whether you want a Pumpkin stake, a black cat or the classic witch on a flying broom, these garden stakes will look pretty dramatic in the dark. Accent them with dull colored light in red or gloomy yellow, and your stakes will look as good as real. 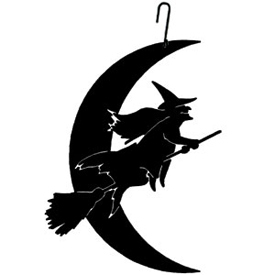 You can also opt for Wrought Iron hanging silhouettes in Halloween themes. These come with attached hooks so that you can easily hang them over the fireplace or anywhere else. The powder coated finish ensures a long life for these pieces and the matte black color is perfect for Halloween decor. You can use these silhouettes to project shadows on a wall with spot lights as well. That would add some serious scare points to your decor. This can be done indoors as well as outdoors on your front wall. 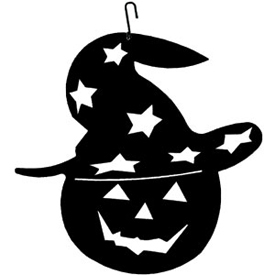 Our Halloween line also offers a Halloween key chain with a witch on a flying broom and you can also find fridge magnets for Halloween: An orange pumpkin and a spooky black Witch Magnet complete with a pointy hat and broom. These make great Halloween gifts as well. Whether you choose a very simple Halloween decor theme or decide to do something elaborate, these wrought iron Halloween props are a great option. You have plenty of time to order these online and have them delivered at your doorstep, hassle free! Please visit TimelessWroughtIron.com to order Wrought Iron Halloween Props.